This winter, with none of the luxuries or fan-fare of the latest big-budget productions filmed in Cleveland, two 2009 Kent State University graduates filmed a feature-length independent film – making their college dream a reality. 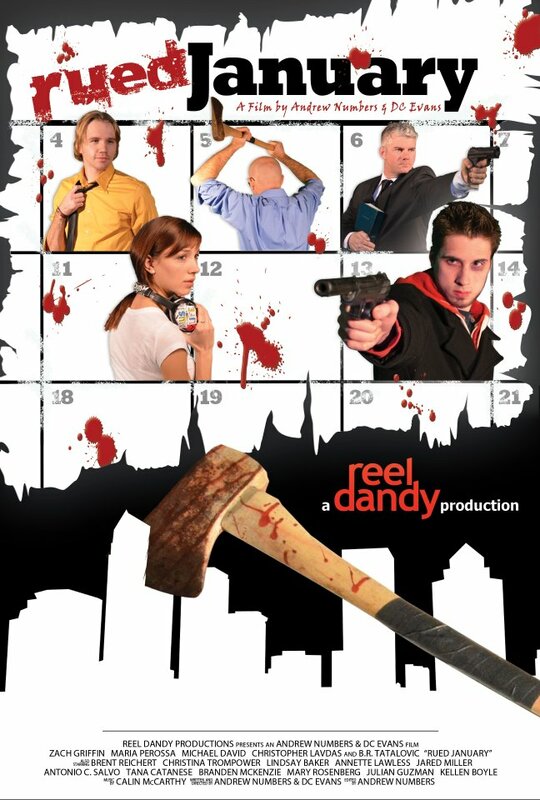 RUED JANUARY is an independent film featuring Northeast Ohio and its talent. It was filmed in just six days, totaling 104 hours on set and made for less than $1,000 by first-time filmmakers Andrew Numbers and DC Evans, who wrote, shot, directed, produced and are currently editing the film. With principal filming complete, the filmmakers are now editing their film and gearing up for the 2013 film festival circuit. They hope to raise enough money to enter the film in at least 30 film festivals through a fundraising campaign on indiegogo.com. The film exclusively features local Ohio actors (16 in total), including award winning independent filmmaker Bruno Tatalovic and Emmy-nominated local news reporter Annette Lawless. It also stars impressive talents Zach Griffin, Maria Perossa, Michael David and Christopher Lavdas. All filming took place in Northeast Ohio and commonly coincided with below freezing conditions during January and February. Locations included: Downtown Cleveland, Avon Lake, Parma, Kent, Cuyahoga Falls, Wickcliffe and Tallmadge. RUED JANUARY is a crime dramedy set in Northeast Ohio. It’s about a twenty something guy who gets in over his head gambling. To settle his debt, he gets mixed up in a botched robbery and has to work for a local crime boss known as The Chief; or face the wrath of The Chief’s axe. “This is a feature length film that we were able to make thanks to years of planning, borrowed equipment, quality actors and virtually no budget,” said Andrew Numbers, filmmaker. The goal of the filmmakers is to continue the momentum and support of Northeast Ohio, making it a community effort to help send them to film festivals. To help support Andrew Numbers and DC Evans’ goal of having “Rued January” represent Northeast Ohio in film festivals across the country, visit www.indiegogo.com/ruedjanuary. To find out more about “Rued January,” visit www.facebook.com/ruedjanuary or follow the film on Twitter (@ruedjanuary).